Can your product stand up to the consumer’s expectation and need! trust me Customers TALK… to each other! If you are into jewelry, how well do the clasps hold! Quality control is important at every step of the design process! Customers can talk you into success or out of it! How does the garment launder, how well does it stand up to ironing. Is the dye colorfast? What about the production house do they deliver a consistent product! So this video takes a behind the scene look at a test we did on a garment from a young indie designer BEFORE going into production. Which was fortunate, she needed to alter her pattern! These are the subtle things that separates a well designed garment from one that is not! It’s also what saves or cost you money! and can destroy a line! Line editing is much more than ensuring you are selling what the consumer wants! It’s about ensuring they do not send back product! What is your quality control procedure.. are there state or federal guidelines you need to observe. what have you NOT thought of… or know about but think you can let slip by! I once asked a crochet designer about her garments and water. She had not lined them and I knew the yarn stretched when wet! The other designer present was shocked…she was not ! She knew there was a problem but reasoned no one would wear these in to the water! her labels did not warn of this! So yes I’m adding a Line editing and quality control to the list of workshops! 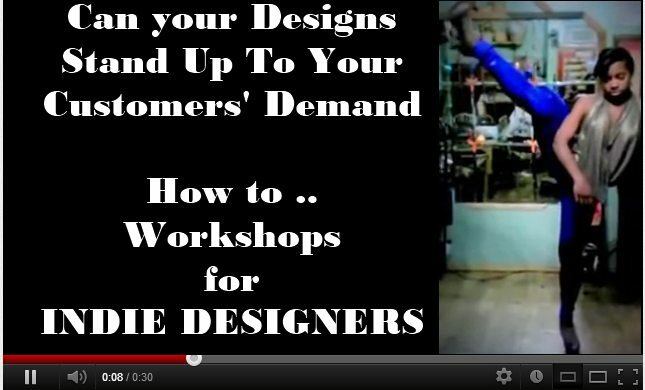 Posted in Uncategorized and tagged Boutique Solutions, How To Guide, Selling Styles, Social Commerce, Workshops.